Whereas the fact that St. Petersburg appeared only in the 18th century, on these lands and in environs the life ebullated as late as in the Middle Ages. A great number of interesting medieval constructions reached our own period. Where can we see them? 1. Landskrona - St. Petersburg, Ohtinskij cusp, place of Neva and Okhta confluence. Fortress was an outpost on the line of the Swedish kingdom and the Novgorod lands at the influx of Okhta to Neva. In 1301 it was completely destroyed by the Russian troops. For a long time it was considered that practically nothing remained from Landskrona. When they were going to build a skyscraper on the Ohtinskij cusp, obligatory in such cases archeological excavations were carried out. As a result there were found the Landskrona's remains that were preserved not badly. Moat apx, the remains of walls, the foundation of a unique wooden tower were found too. All this magnificence was called "the Russian Troy". Under pressure of the public, the authorities decided to build a skyscraper in Lahta. The future of the unique place of excavation still being unknown. 2. Korela - Priozersk, Leningradskoye Highway, 3. The fortress was presumably found in 12th century. It was repeatedly captured by Swedes, and in 1721 Keksgolm (the Swedish name of the fortress) passed to Russia. Now there is an interesting museum working at fortress. The museum tells about its history. Visitors can walk across the territory of fortress, visit the Round tower, look at GI tanks and howitzers, and at additional charge to shoot from the cannonry. 3. Shlisselburg and Oreshek fortress - at the place where Neva flows from Ladoga Lake. The settlement was founded by the duke Yury Danilovich in 1323. 30 years later Novgorodians put fortress there and called its Oreshek . Fortress was located on the Orekhovyj island (hence the name) in the place where Neva flows from Lake Ladoga. During the Smuta it passed to Swedes and those called it Noteburg ("key - city"). In 1702, it was won by Peter the first and he calls it Shlisselburg. The view both on fortress, and from its towers - there is no more beautifull place. Exactly the Oreshek fortress became the first multitower construction as a part of Muscovy. After 1702 it became one of the most important prisons of the Russian Empire where Lopukhina, Ioann Antonovich and Decembrists at different times served time in jail. 4. Kopor'e- the Kingiseppskij district of the Leningrad Region. The first mention of this fortress falls on 1240. It was repeatedly reconstructed and several times passed between Swedes and Russia. In 2001 fortress received the status of the museum. Now it is partially destroyed, but it is possible to go down to ancient cellars vaults. At the moment because of critical condition of fortress the access to it is limited. 5. Vyborgskij Castle - Vyborg, Castle island. The unique castle of the European style on the territory of Russia, it is impossible to find the analogue. The castle was found by Swedes in 1293, in the 18th century it was won by Peter I's troops. The main sight of the lock - is the Olaf tower. On a tower it is possible to rise by the observation deck from where the city is spread before the eyes. In the museum there are six thematic expositions opening various periods in the history of the city and castle. 6. Ivangorodskaya fortress – Ivangorod. 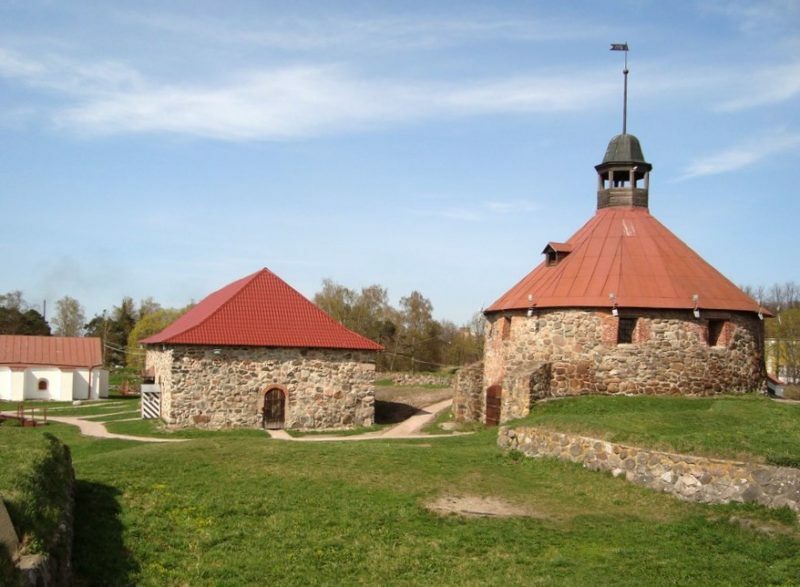 Fortress was founded in 1492 on the Narova River (Narva), near the erstwhile border with Livonia. At first it was quadrangular and not strongly corresponded to a land relief. Final (in fact, present) look it took in 1558 when they attached "Boyarskij val" to it. Fortress preserved not bad, it is still possible to get quietly on its walls. Besides, there are also internal constructions like the Proviantskaya tower or the Assumption Cathedral constructed in the 16th century in that small interval of time when Russia took control of Ivangorod again being in good keep. 7. A Horse Stone - the Konevets island. In the Middle Ages in the territory of the present Leningrad Region there were numerous tribes which remains now live in small villages in the east and the southwest of the region. Many of these people were pagans, many their cult constructions, the best-known of which, the Horse Stone, located on the Konevets island, reached our days. The people living here in age-old times believed that the Horse Stone inhabit evil spirits. Every year at the beginning of summer locals lead the cattle here to have a graze. The summer passed and as soon as leaves began growing yellow, people took away the animals, leaving a sacrifice to the stone and spirits of a horse (hence the name). After a while the racer dissapeared- it meant that spirits took him away and that the residents of a village managed to cajole them. So were the several centuries until the Reverend Arseny arrived. He carried out a prayer and as the belief says, expelled spirits from a stone. Now, there is a chapel at the top of a stone to intervene the evil force in taking control of the island again. 8. A labyrinth on the Krutoyar island – nearby Vyborg. Most of the people inhabiting region in the Middle Ages was engaged in hunting and fishing trade: agriculture on marshy and stony soils was impossible. Being pagans, they did everything to cajole their heavenly patrons. On the Krutoyar island was preserved the small narrow labyrinth laid out from a stone. In the neighbourhood with a labyrinth there are remained ruins of the former Finnish village Kotisaari or Pitkyapaasi. Time of a labyrinth construction was not determined yet, but exactly through this labyrinth fishermen and seamen have pass before taken the sea. It was thought that it brings them luck and protects health. They say that some Finnish and Karelian fishermen went through similar labyrinths at the beginning of the 20th century too.